As a billow of smoke leapt from the rocket boosters and a thunderous noise shook the ground, a shuttlecraft cleared the launch tower at the Kennedy Space Center, its neon orange tail contrasting the ocean-blue Florida sky. On April 12, 1981 — 35 years ago this week — the Columbia shuttle launched from Cape Canaveral, blazing a new path for space exploration as it became the world’s first reusable shuttle to travel into space. At the NASA press site, in the midst of journalists from publications such as Time Magazine and Newsweek, stood two Loyola Phoenix seniors, their cameras pointed toward the sky. One of the full-color photos they took would later cover the entire front page of The Phoenix — a costly feat that other newspapers such as the New York Times and Chicago Tribune didn’t attempt. The Columbia marked a new era in space history because as the world’s first reusable shuttle, it was designed to be used 100 times. A renewable shuttle, if executed correctly, creates shorter turnaround times — the time it takes to prepare a spacecraft for another launch — and could save NASA money, according to Airik Phillips, a facilitator at the Adler Planetarium. The launch was also significant because in the early 1980s, Americans looked to its space program when society wasn’t prospering, according to Ted Karamanski, a U.S. historian and Loyola’s public history graduate director. Gunty: They’re looking for people to write about the space shuttle launch. O’Dea: Oh, that would be awesome. So, you want to write about it? Gunty: No, I want to go. 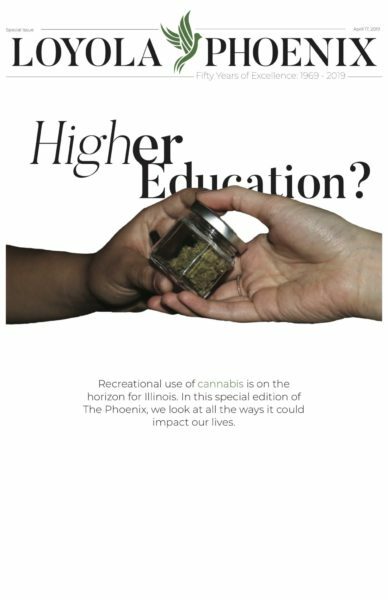 After sending a letter to NASA for press approval, arranging finances with the university and informing their teachers they wouldn’t be in class, The Phoenix reporters hit the road Wednesday night, a day and a half before the scheduled launch. Armed with Jolt Cola and snacks, they started their 1,200-mile trek in Gunty’s parents’ Datsun B-210, a car that O’Dea joked “got an extra three miles per gallon when [Gunty] emptied out the ashtray.” The backseat of the car was taken up by O’Dea’s three-foot, 800 mm rented Nikkor lens and Nikon F2 camera. This optimism slowly turned into panic as the reporters hit bumper-to-bumper traffic. They made a pitstop at their hotel just outside of Orlando, but when they switched on the TV and saw how crowded it was by the launch site, they jumped back into the Datsun. O’Dea estimated that the last 100 miles of the trip took six hours. Cars drove on the shoulder and many families parked on the side of the road just to get a glimpse of the launch. The student journalists made it to the press gate to grab their passes, arriving there at 6:46 a.m., four minutes before the scheduled launch. But the press room had closed at 4:30 a.m.
Fortunately for O’Dea and Gunty, a computer malfunction during the final seconds of countdown postponed the shuttle’s launch and it was rescheduled for that Sunday, April 12, at 7 a.m. The pair decided to spend Saturday night at the outdoor press area to avoid missing the launch the next morning. They were joined by several other journalists, who offered O’Dea and Gunty camera tips. And they were nervous for a reason. The Columbia launch was the first manned launch since 1975, and NASA was using a new thermal tile system. Instead of coating the bottom of the ship with a heat shield that burns off, the shuttle was covered with 31,000 heat resistant titles. This process was more complex, according to Phillips. On the morning of the launch, O’Dea and Gunty stood at the press site and pointed their cameras to the 184-foot shuttle, three and a half miles away. The Columbia launched on time at 7 a.m. and accelerated faster than any manned spaceship had before, according to the 1981 Loyola Phoenix issue. The two students returned to campus on Monday afternoon to finish reporting the story, missing the shuttle’s landing on Tuesday, April 14. The Phoenix didn’t print the story until April 24, but it did do something the Chicago Tribune and New York Times didn’t do: print the Columbia’s debut front-page picture in color — a choice that took more time and doubled the cost of The Phoenix’s production, according to O’Dea. The Phoenix was the only newspaper in Chicago to publish color photos of the first Columbia launch, according to Gunty. He explained that it wasn’t typical for newspapers to print in color because it was “an incredibly difficult process.” The Phoenix seldom printed in color. The printing process in the 1980s is similar to that of a printer now — separating each picture into four different color plates — but it wasn’t widely available on computer software. The Phoenix ordered its color printing from New Horizons Color, a business that specializes in color separation. Putting the stories on page was also a meticulous process. Instead of using Adobe InDesign like The Phoenix does now, the 1981 staff used typesetters, students who manually typed the newspaper. These typesetters were the only paid Phoenix staff members at the time, according to O’Dea, which made him proud that unpaid student writers stuck around until 4 a.m. to make sure the issue was published. The Columbia shuttle covers the entire front page of The Phoenix’s April 24, 1981 issue, accompanied by the headline “Columbia: Space Travel enters a new age.” Nestled among articles about Loyola’s new IBM computers and classified ads for babysitters sit four full pages on the reporters’ journey and the historic shuttle launch. It also includes 10 photos, seven of which are in color. Current students can see a copy of the issue in the Loyola Library archives. Gunty, now editor of The Catholic Review in Maryland, estimates he’s watched six to eight more launches, some of them with his children. O’Dea, who’s now the director of IT infrastructure services at the insurance company CNA in Chicago, keeps in touch with Gunty. They look back on the 35th anniversary of the launch as a time of adventure and exploration. The shuttle program ended in August 2011. Although the 1981 Columbia lost 16 of its 31,000 thermal tiles and damaged another 148, it returned to the ground after orbiting the Earth 36 times. It completed 27 more journeys, but its debut is what demonstrated America’s “technological mastery” and “started to lift up the spirits of the country,” according to Karamanski.